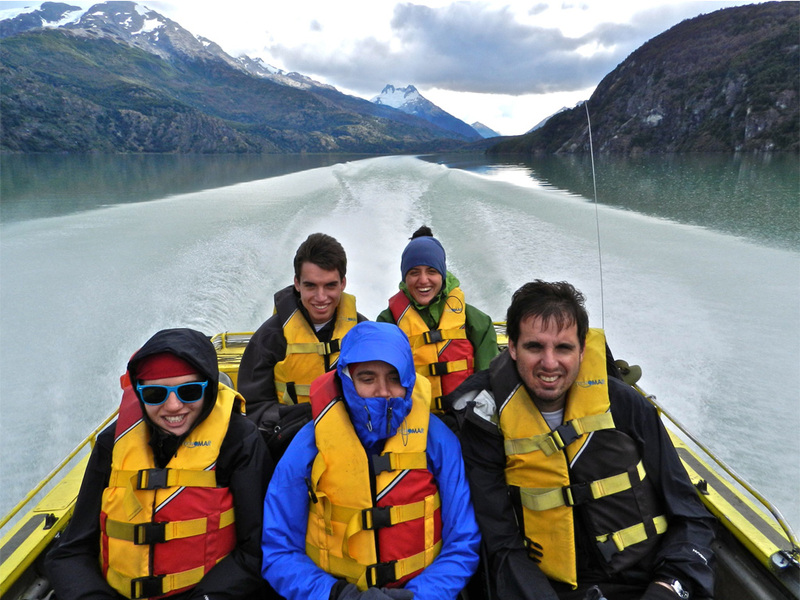 Patagonia Jet full day excursions are incredibly complete and include: lake crossing, river navigation, trekking, canopy (optional), glacier walks and lunch etc. to give you the opportunity to live the ultimate experience. The configuration of our jet boats is totally flexible and adaptable to different requirements. In only a few minutes we can transform the 12 person capacity boat into a cargo boat to transport equipment for recreational, scientific, humanitarian and social purposes, or for rescue and emergency operations in remote areas. Departure from Puerto Guadal. Navigation along the south shore of Lake General Carrera towards the Marble caves. We visit the cave and then continue our journey to the 3 Islands, where we will have panoramic views over the lake and towards Mount San Valentin. Return to Terra Luna. All abilities. Departure from Puerto Guadal. 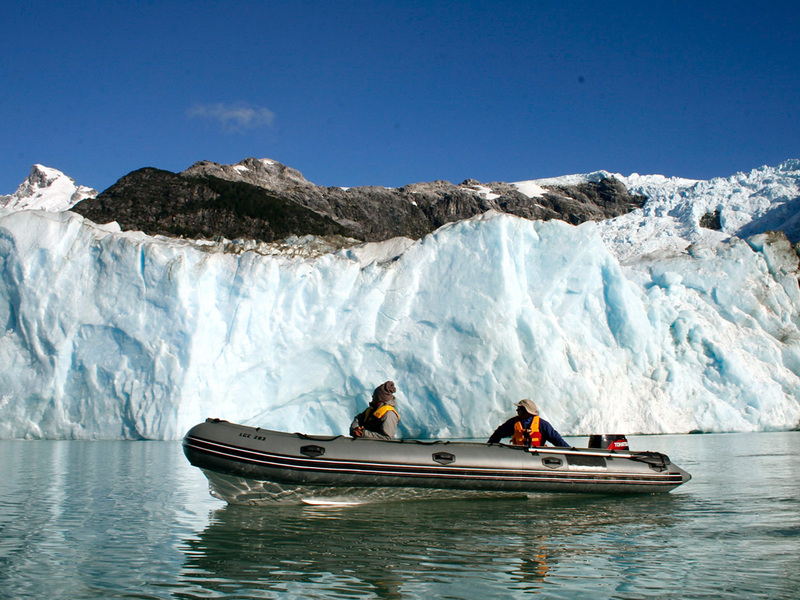 Navigation to the outlet of Lake General Carrera, then we continue on Lake Bertrand, surrounded by stunning mountains and hanging glaciers. We travel across the distinctive grey waters of Lake Plomo, and make our way to the village of Puerto Bertrand to see the impressive beginning of the Baker River. After a short visit to the village, we return to Terra Luna. All abilities. Departure from Puerto Guadal. Navigation on Lake General Carrera, towards the chapel of Marbel. After visiting, we continue to Pto Sanchez village. 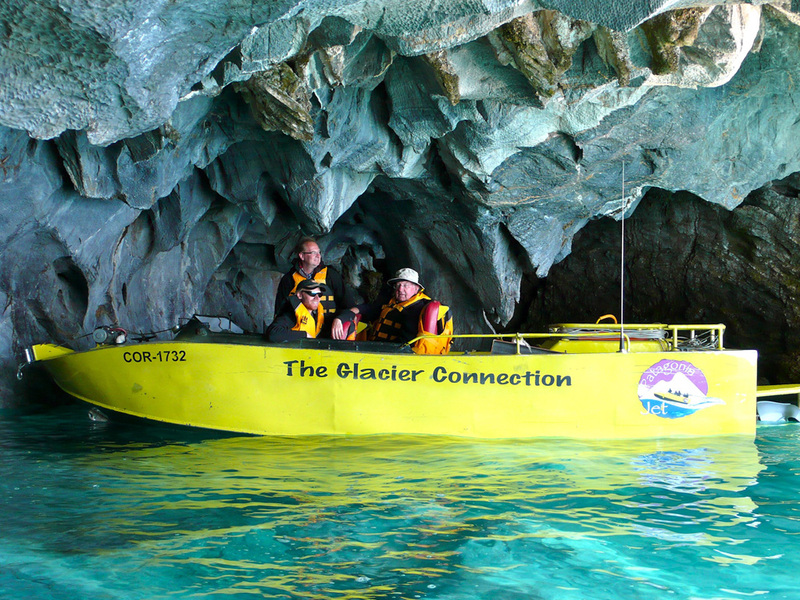 We visit the marbek caves and rocky formations of the surrounding islands. Back to Pto Guadal. All abilities. Departure from Pto Guadal. Navigation on Lake General Carrera to the outlet of the Leones River (20mn). We travel for 40 mins up the Leones River and then walk (30mn up to 1 hour) to reach Lake Leones. Navigation on Lake Leones toward the spectacular terminal face of the Leones Glacier, where we observe the 3 separate branches of the glacier calving into the lake. Lunch in front of the glacier. 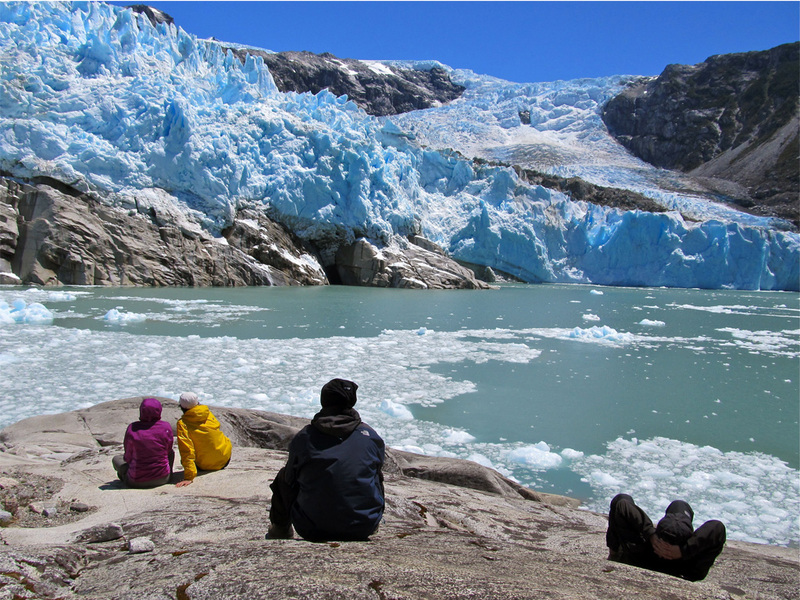 Ice walk optional.Once back at the boat we will travel back to Pto Guadal. Duration 8 hours. Easy. Caminata sobre hielo opcional. Regreso a Pto. Jet y navegación de vuelta a Pto. Guadal y puestos intermediarios. Duración 8h. Fácil. Departure from Pto Guadal. Navigation on Lake General Carrera to the outlet of the Leones River (20mn). 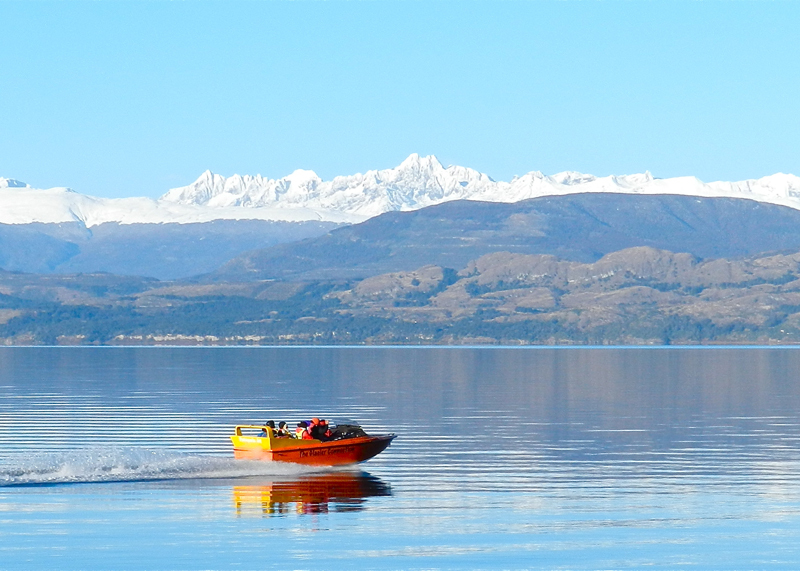 We travel for 40 mins up the Leones River and then walk (30mn to 1 hour) to reach Lake Leones. Navigation on Lake Leones toward the spectacular terminal face of the Leones Glacier, where we observe the 3 separate branches of the glacier calving into the lake. Lunch in front of the glacier. Walk on the glacier. Once back at the boat we set aur camp on lake Leones. Overnight facing the glacier. 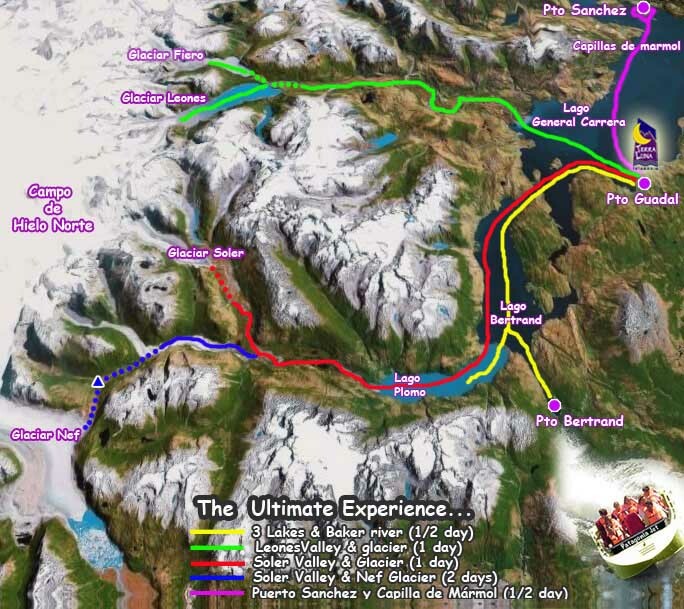 The next day, trekking (1h30 to 2h) to Lake Fiero and navigation to Glacier Fiero. Back to the camp abd then to Pto Jet from where will jetboat back to Purto Guadal Medium effort.